Have you been wondering what you're going to do with that rectangular vase you have sitting in the cupboard? Don't throw it away. 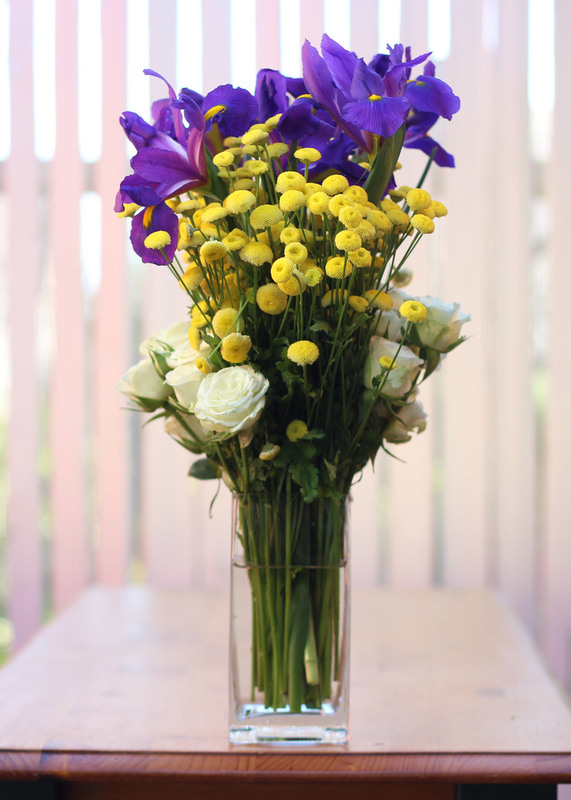 Here's an arrangement that is modern and super easy. The most important thing to remember about this arrangement is that it is sculptural. (It has four distinct sides and you need to make all four sides look good.) They need to be balanced and have the right shape. So, as you put the Button Mums and the Roses in, you need to add them to each side, and at the end make sure that you have a good shape on each side. The blooms in this arrangement take up the top half of it. Within that half, the proportions follow the Greek rule of the "Golden Mean," a ratio of 1/3 to 2/3rds. The Iris make up roughly the top third, the Button Mums make up the next third, and the Spray Roses make up the last third. Most of the time, the eye sees these things subliminally, but it is good to analyze an arrangement to see what makes it work. Okay, critique is over. Let's get to work. 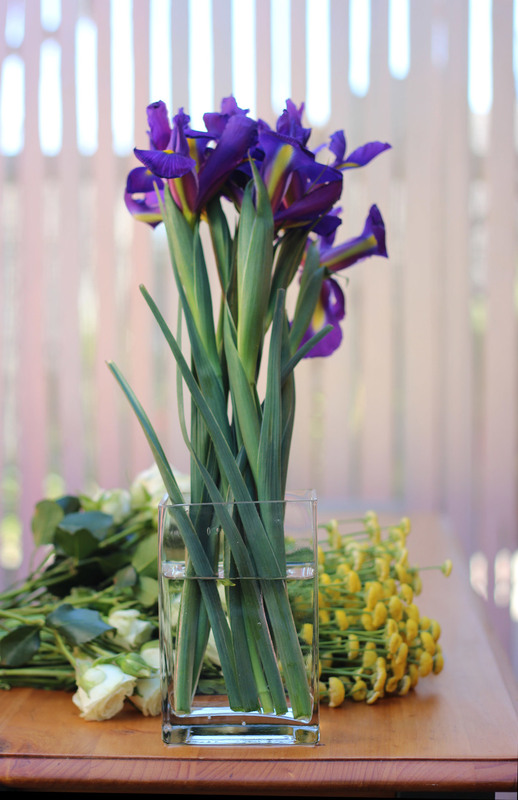 Lay your flowers out how they will stand in the vase and cut the stems. Pout your water to a couple inches below the top. Plcae your iris in the center. Pull off all leaves below the water line. Add Button Mums to all four sides. Next add to sides and back. Add Spray Roses to front. "Ah, these roses smell good," says Dobie. "But drat!" he laments. " I can't get my head in there to get a drink!"